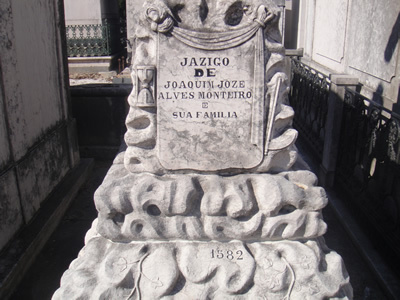 The mortal remains of Amália Rodrigues, the famous fado artist, were transferred to the National Pantheon in Lisbon (under enormous pressure from her admirers and a change in the law requiring a minimum of four years before repatriation). 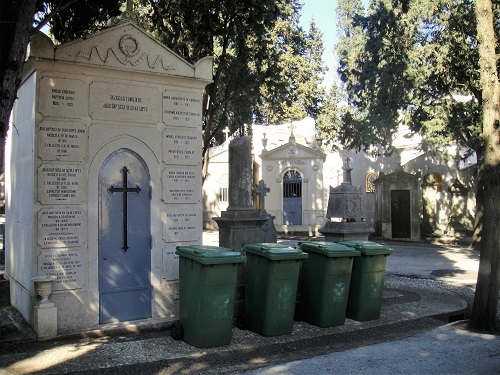 After the city of Lisbon was hit by an outbreak of cholera in 1833, causing thousands of deaths, it was urgent to create a large cemetery for both rich and poorer victims. 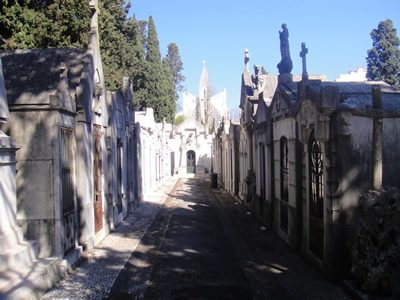 It has the weird name of Cemetery of ‘Pleasures’, called after the nearby neighborhood (Prazeres) with the same name. Many of its tombs are big mausoleums, some with the size of small chapels. 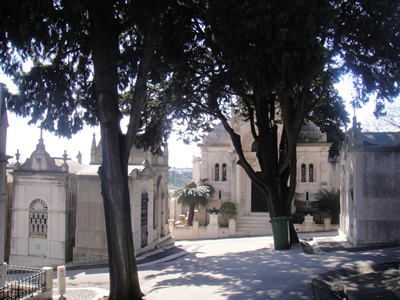 Once you enter the cemetery the sound of the city fades and the tranquility overwhelms you. Beautiful trees, a strange atmosphere and joyful singing of birds. You imagine yourself walking in a previous century, only disturbed by plane noise, rather loud, every 10 minutes. 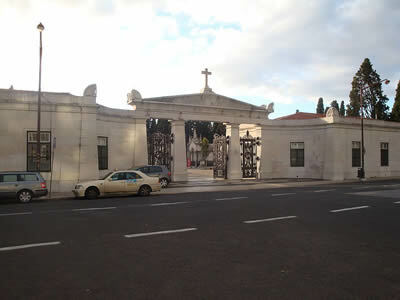 The cemetery is located close to the landing/take-off zone of Lisbon’s airport. 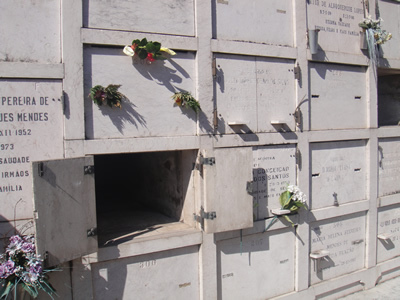 Most of the Prazeres mausoleums belong to rich, old or ‘important’ families, like f.i. the Palmela family. Many of the mausoleums are richly elaborated, have fine sculptures and decorations. There are also statues of the deceased. It’s like a ‘city in a city’ for the dead, with well-defined lanes (70! ) and funerary chapels that were built to look like little houses. The unusual about a lot of these graves is that they have little “front doors” with glass windows through which you can see the caskets and remnants of the dead and their visitors. 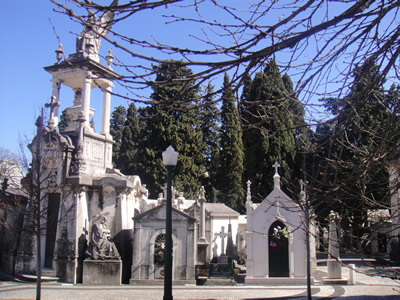 Most of the trees are a species cypress (Cupressus sempervirens), much used in Portuguese cemeteries. 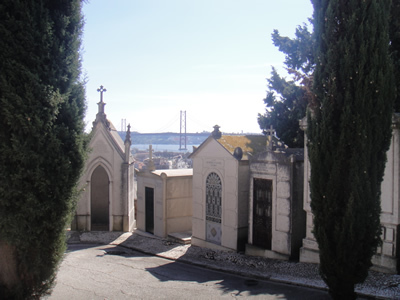 The cemetery also provides great views over the Alcântara valley, the river Tagus and the 25 April Bridge (Ponte 25 de Abril). 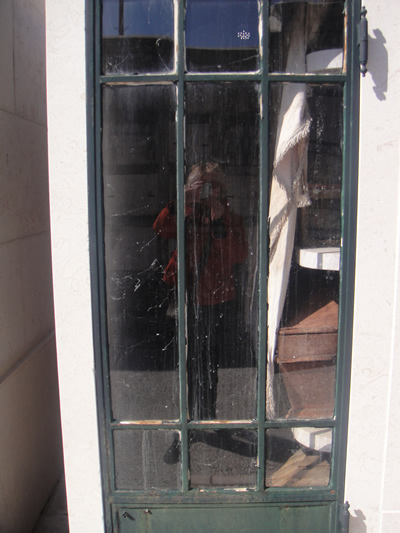 An example of a ‘front door’ with glass windows through which you can see the caskets. I am a novelist and I just returned from 3 weeks in Portugal. 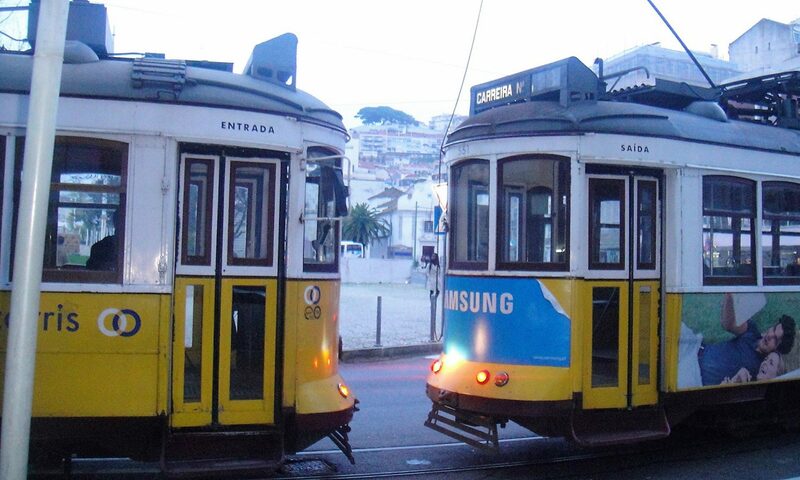 One of my best experiences was ending up at the Largo dos Prazeres by accident. I am now inspired to write a novel that takes place there. I hope to write a story where a woman finds herself among the crypts and has amazing and insightful conversations with some of the inhabitants. I have no desire to write a zombie or typical ghost story. Each person my character meets will talk about their life and will provide some type of enlightenment to her. My problem is I am having great difficulty finding much online about this cemetery. The only other links I’ve found are even less detailed than the above. Is there a website or email address I can contact where I might get more information about who is buried here? Thank you for any help you can offer.